Last Week in Review: After months of decline, Housing Starts were on the up and up in June. Building Permits were up too. Forecast for the Week: The Fed monetary policy statement could be the standout in an economic-data-filled week. View: Tap into professional motivation with this week’s icebreakers. “I want to jump for joy.” 2 Unlimited. After three straight monthly declines, Housing Starts jumped in June. Building Permits did too. Housing Starts surged 8.3 percent from May to an annual rate of 1.215 million units, the Commerce Department reported. This is the highest level since February. Single-family starts, which represent the largest share of the residential housing market, rose 6.3 percent. The multi-family dwelling sector soared as well. 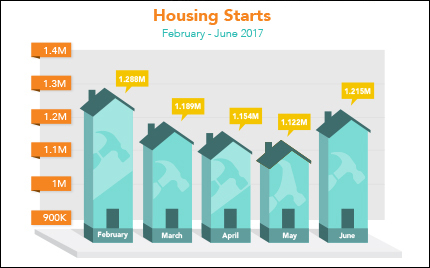 Housing Starts also were up 2.1 percent from June 2016. While the increase in Housing Starts and Building Permits is positive news, both have some ground to cover. Inventories for existing and new home sales are still running below what is considered the normal six-month supply. In addition, higher prices for lumber and shortages of workers and land space could be potential hurdles to jump in the near future for new homebuilding. At this time, home loan rates remain just above historic lows. Fed monetary policy could be the cherry on top of this week’s five-layer data cake. Housing data kicks off on Monday with Existing Homes Sales, followed by the S&P/Case-Shiller Home Price Index on Tuesday and New Home Sales on Wednesday. Consumer Confidence will be delivered on Tuesday while the Consumer Sentiment Index releases on Friday. Though not an economic report, the Federal Open Market Committee meeting begins Tuesday and will end on Wednesday at 2:00 p.m. ET with the release of the monetary policy statement. Durable Goods Orders and weekly Initial Jobless Claims will be delivered on Thursday. And last but not least, the first reading on second quarter 2017 Gross Domestic Product will be released on Friday along with the wage-inflation-reading Employment Cost Index. As you can see in the chart below, Mortgage Bond prices have edged higher in recent days leaving home loan rates in attractive territory. If your conversation starters are starting to sound like boring small talk, liven things up with better questions. People will find you, and the conversation, more interesting and engaging. “Why did you choose your profession?” The answer to this question can provide you with insights about motivations and passions. But even more, it can provide you with opportunities for further action. For example, if someone is unhappy in a current position, you may be able to help with a bit of mentoring, a referral or offering friendly advice that will be appreciated and remembered later on. “What was the highlight of your work week?” There’s nothing like starting off a conversation on a positive note, and this question gives the other person a chance to share wins and maybe even brag a little bit. Be prepared to share your own win for the week! “What do you appreciate most about your current role?” Again, this starts a conversation out on a positive note. Moreover, the answer can give you insights into the person’s business or key players at that company. You can remember this information when you give shout outs on social media posts or as you reach out and network to develop more professional partnerships. Never be stuck for something to say when meeting someone new again. Commit these icebreaker categories to memory, and you’ll be coming up with your own interesting questions in no time!